Marchionne plans to retire early next year after seeing the business plan through 2018 to completion. Fiat Chrysler Automobiles committed to meeting ambitious 2018 financial targets set by outgoing CEO Sergio Marchionne, as the automaker builds on a shift to SUVs and crossovers that boosted earnings last year. FCA said fourth-quarter earnings before interest and taxes rose 22 percent to more than $2.3 billion. Net profit nearly doubled to $997 million. Total revenue in the quarter fell 3 percent to $35.9 billion. FCA has been retooling some U.S. factories to boost output of lucrative SUVs and trucks while ending production of some unprofitable sedans to boost margins in North America and close the gap on larger U.S. rivals General Motors and Ford. FCA’s performance also improved in the other regions where it operates, including Europe, Latin America and Asia. It cut net industrial debt to 2.4 billion euros ($3 billion), down from 4.6 billion at the end of 2016. For 2018, FCA's adjusted earnings before interest and taxes will total at least 8.7 billion euros ($10.8 billion), the automaker said Thursday in a statement, equal to the lower end of a profit range it’s been targeting in a five-year business plan. The company bolstered profit margins with lucrative SUVs and crossovers at its Jeep, Alfa Romeo and Maserati divisions. New versions of the Jeep Wrangler SUV and Ram 1500 truck and a refreshed Jeep Cherokee are slated to go into production in the first few months of this year. In addition, changes in U.S. tax law are projected to save the company $1 billion a year. Improving margins in North America led to $5,500 profit-sharing checks on average for UAW members, up from $5,000 a year earlier, Fiat Chrysler also said. These payouts will be on top of a $2,000 bonus paid to all U.S. workers, except for top executives, related to the U.S. corporate tax cuts. Fiat Chrysler cut its industrial debt almost in half last year, to 2.39 billion euros ($2.97 billion) from 4.59 billion. The company could be debt-free by the end of the second quarter, Marchionne said last week in Detroit. Marchionne plans to retire early next year after seeing the business plan through 2018 to completion and setting out a new mid-term strategy in coming months. 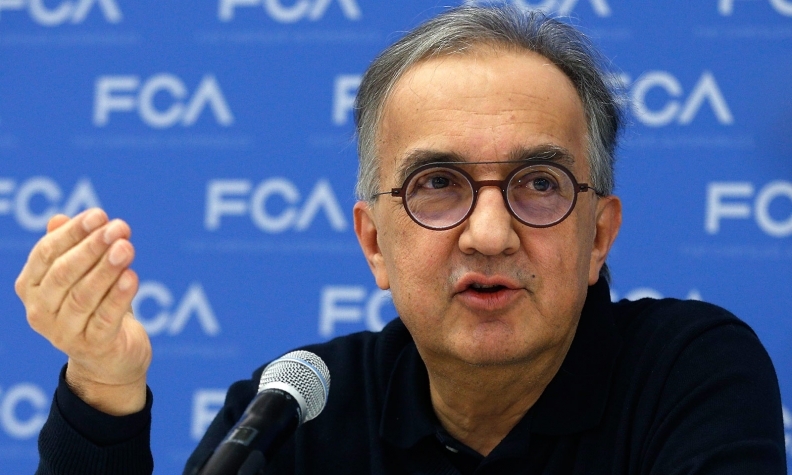 The CEO, who has run Fiat since 2004, has said he expects one of the automaker’s top managers to succeed him.